This is not a real voltmeter but more an indicator for the battery voltage with 3 leds. I'm using it in my car and with a quick glance I can see it's all green and the battery is ok, easier than to read a display in heavy traffic. 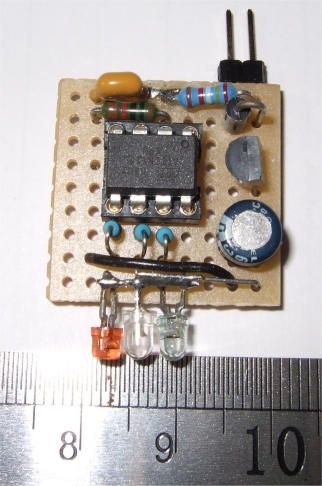 It could be done differently by why not give some task to the old workhorse ATtiny15. It is reading the battery voltage with ADC3 and a voltage divider, R5 is 24.8k (sorry) and R4 is 10k to GND. Then there are some thresholds defined in the assembler program and a red, green, and yellow led is turned on depending on the voltage: red below 10 V, red&green 11.5V, green between 12 and 13.8V and yellow above 14V. Nice and easy. With another voltage divider just redefine the thresholds. 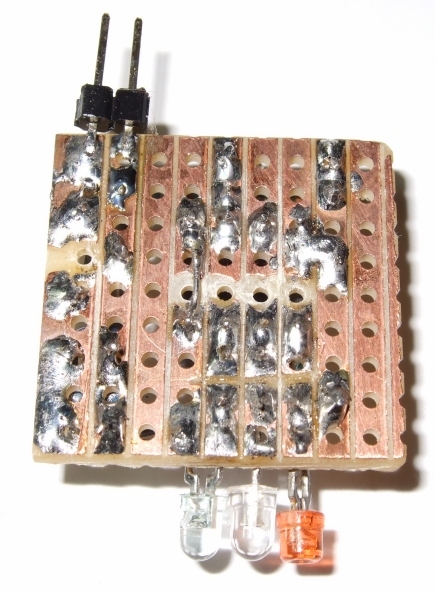 There is a reverse diode at the input to protect against spikes in a car. It might be wise to add a 10 Ohm resistor in front, but it works like this in my car and has not blown a fuse yet. It might be build even smaller than you see here and could fit in the plug of the cigarette lighter. I drilled holes in the dashboard, it's an old car. A possible layout of the board, top and bottom view. It is a quick and easy project but once you have it you'll find it useful. ; If ADLAR is set, the result is left-adjusted. Nachtrag: Sebastian Heyn wies darauf hin, dass die Schaltung nicht gegen Spannungsspitzen geschützt ist, wie es im Automotive-Bereich üblich ist. Man kann z.B. eine Suppressordiode mit einem Vorwiderstand einsetzen. Üblich ist auch eine Induktivität in der Versorgungsleitung. Bei privaten Spielereien kann man die Schaltspannung vom Radio (für externe Verstärker oder Phantomspeisung) nehmen, die ist fast immer durch die Schutzmechanismen des Radios mitgeschützt.